To see the detailed list of features done in the 3.x cycle please check the Release Notes for each version. We've setup a Jira dashboard to present the work done during the previous cycle. In summary, 1444 issues have been closed by 19 committers (and other contributors providing patches), out of which 664 are fixed bugs. Application Within Minutes allows people that are not tech experts to create their own applications with as little steps as possible. Extension Manager allows users to install new applications to their wiki. The Extension Manager is a feature for installing, uninstalling and upgrading XWiki extensions. XWiki Enterprise Manager has adopted the "XWiki Workspaces" Application which allows you to create workspaces and collaborate with other users. A workspace is basically a subwiki used by a group of global users which allows them to be invited by an administrator, make join requests or navigate through the main wiki and the available workspaces. A workspace can be created by any user and every registration request is redirected to the main wiki. The deletion of a workspace is reserved to its owner or to an administrator. XWiki Workspaces is the new XEM. With the User Status feature, users can now post status messages which will be visible on the main dashboard and on the user profile page. Users can follow each other's activity streams. If you configure your wiki to work with an office server (LibreOffice or OpenOffice) as described in the Office Importer Application you'll notice a new entry in the export menu (as long as you are connected to the office server). By default only the ODT (OpenDocument Text format) export is exposed but you can tweak the export URL to export to other office formats supported by your office server. Check out Document Export for more details. After wiki- and space-wide dashboards, XWiki supports user dashboards. Each user can define their own dashboard in their profile document, and they can use it either in their profile document, or display it instead of the homepage default dashboard. If you export a wiki page to PDF using the Export menu you'll get a panel where you can configure some PDF export options. These options are defined in the PDF velocity templates and were previously available only as query string parameters to the PDF export URL. More tuning of this feature can be found here. The Search results retrieved by the Lucene plugin have been for a long time the target of many improvements, since documents that were actually relevant for a query usually appeared too low in the results list. This issue has now been improved, by scoring results differently depending on the field where the search query matches. XWiki Enterprise 3.4 comes with a new default color theme and other three (Mint, Ruby and Dusk) that you can choose from. All four use CSS3 rules and new color variables in order to be able to have gradients. All color themes that were previously available are now considered deprecated and have been published as extensions: Default, Bordo, Nature, BlueSky, Inner Dark, Nightfall and Peach. We have redesigned the Administration Application providing a new layout and new icons (the icons are designed by Ciprian Amaritei). Administration sections are now grouped in several categories displayed using a vertical menu. Each section has been modified in order to be consistent with our Vertical Layout Usage Form Standard. The sections have been reorganized as well, making them more intuitive. 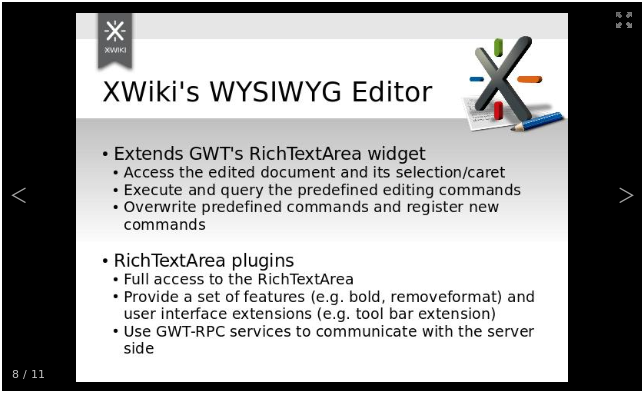 The WYSIWYG content editor can now be easily configured from the wiki administration. Look for the WYSIWYG Editor section under Applications category. You may still need to scan the list of available plugins and features in order to know what to enable. Attachment Selector Macro is now bundled with XWiki Enterprise. The suggestions proposed come from several sources, configurable in the wiki administration under the Search Suggest section. The sources configured by default include "Document name", "Document content", "Attachment name", "Attachment content" and "Users". The action menu is now minimized when the page is scrolled. You can access it by hovering the top of the browser window. Compatibility with IE6 meant that whenever transparent icons were needed, we had to rely on GIF images, which is a limited file format with only 256 color palettes, simple "yes or no" transparency, and non-optimal compression. Because of this, most of the icons had a visible white border that contrasted on darker background colors, and in general were more crisp than the original Silk icons. Having dropped the requirement of supporting IE6, we switched to using the official PNG version of the Silk icons, which appear much better on all backgrounds. While subtle, the improvement is noticeable and does contribute to a more professional look. XWiki Enterprise 3.1 was the first version to be released from our new repository on github. We decided that git was sufficiently advanced over svn, our old version control system, that it warranted the effort spent to convert. If you are a developer who uses git then you already know what this means to you, you can participate in the XWiki development process by forking (git speak for copying) the source repository rather than being forced to provide patches to the benevolent committers who will accept or reject your patches at their pleasure. If you want to make something great but there's a part of the XWiki core which is holding you up, you can go right ahead and fork it into your own repository where you can fix it and share the results. We are excited to learn what you will create! As a consequence, the structure of the repositories, the version numbers of the applications, plugins and build tools, as well as the structure of the projects on the issue tracker have changed. We moved all the plugins and applications inside the platform core, releasing them all together. This is also reflected in the issue tracker, where all the individual projects for each extension disappeared, since applications are now jira components inside the XWiki Platform project. This means that the version number confusion will stop, since everything has the same release version. Moving further along the separation of modules from the old monolithic core, several modules that don't depend on the XWiki platform, or on the wiki paradigm in general, have been extracted to two new top-level repositories. XWiki Commons contains modules offering basic functionalities such as a powerful Event bus with Listeners, a generic and very lightweight Injection framework with a simple component lifecycle, XML and HTML/XHTML manipulation and cleaning APIs, and so on. The XWiki Rendering Framework is a generic syntax conversion framework, providing support for almost 20 syntaxes. All modules from these two repositories don't depend on the XWiki core and can be fully reused in any project. Even more, they are made available on the central maven repository.